Eighth grade Spelling Bee Champions from Easterbrook Discovery, Latimer, and Moreland Middle schools will compete in a SCRIPPS National Spelling Bee online test this month, with a goal of being among the top 50 in the region to move on to the Bay Area Regional Spelling Bee in Pleasanton in February. 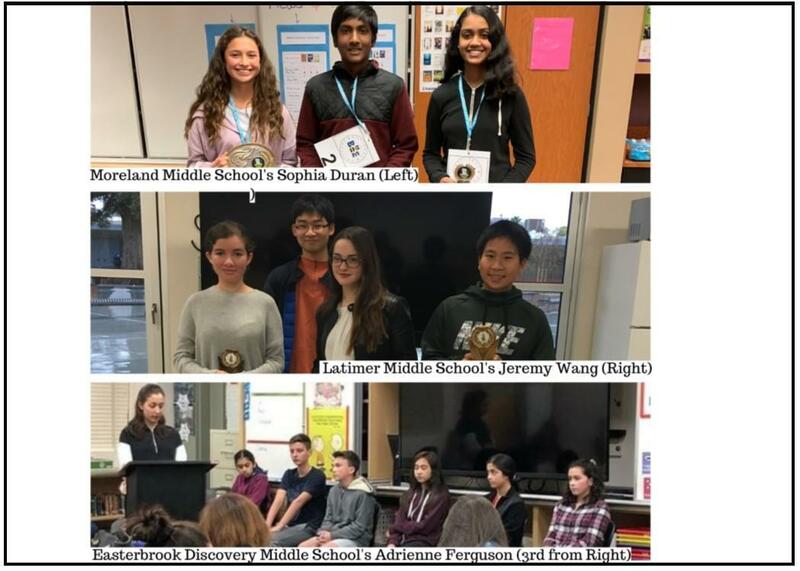 January 16, 2019, San Jose, CA: Eighth grade Spelling Bee Champions from Easterbrook Discovery, Latimer, and Moreland Middle schools will compete in a Scripps National Spelling Bee online test this month, with a goal of being among the top 50 in the region to move on to the Bay Area Regional Spelling Bee in Pleasanton in February. 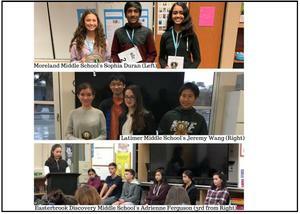 Local Spelling Bees took place at each middle school in December and January for all 6th, 7th, and 8th grade students. The top three winners at each grade received a trophy and the 1st place winner of the 8th grade competitions move on to represent their schools in the Scripps 2019 online test. The top 50 students of the online test will move on to the Bay Area Regional Spelling Bee, where the winner will then move on to compete nationally. Last year, Easterbrook Discovery School (EDS) student, Chanelle Chu, represented EDS and Moreland School District at the Scripps 2018 Bay Area Regional Spelling Bee Finals.